Fast and Affordable QuickSites: $599 for Limited Time! QuickSites are the perfect solution for startups or small businesses on a tight budget and schedule. Most QuickSites can be completed in 24 - 48 hours*. For larger businesses this would be the perfect solution for a spin-off website that directs traffic to the main website, for minimum investment. The existing design chosen and approved will be used "as is" with no customization*. All content for the site (text and photos) will need to be provided to us before development begins. One revision is allowed after all the content has been installed. Up to 5 pages included in the development**. *Optionally: any requests for customization or revisions will be billed at an hourly rate and added to the final balance. ** Pages over 5 pages built at an hourly rate. As with all of our website development, standard organic search engine optimization is included with our QuickSites. Keywords and keyword phrases are woven into the page titles, paragraph headings, sub-headings, body copy, meta description tags, image alt tags and more to make your QuickSite found easily in all major search engines. An xml sitemap is developed and submitted to Google and Google Analytics is incorporated into your site - all at no additional costs. The finished product is a professional, responsive website at a cost much less than that of a completely custom website. By skipping the steps of market research, design mock-ups, and numerous revisions, we eliminate most of the hours required for a custom website and we pass those savings onto you. 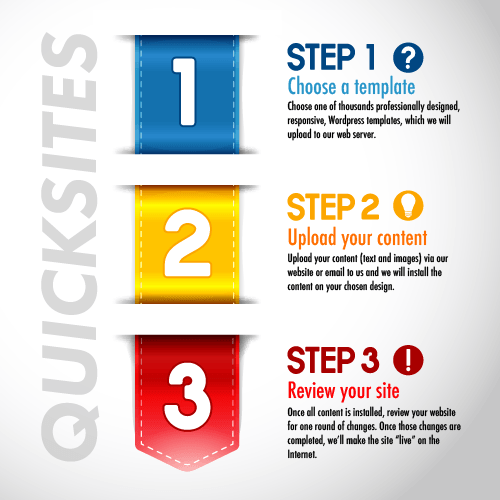 The time it takes to develop a QuickSite is cut in half, so your site is live on the Internet and generating business. Contact NC Web Pros today for a quote on your pre-designed QuickSite website.